ACS Underground Solutions can clear environmental test bores on any proposed sites. Test bore clearings are performed in the same manner as a utility mark out by attaching to the known utilities and sweeping the areas in a passive mode and using Ground Penetrating Radar (GPR) which allows the contractor to drill, excavate and perform their samples for the site. Ground Penetrating Radar (GPR) is a non-intrusive testing method used for a variety of locating purposes. GPR may be used for a broad range of engineering, environmental and construction applications. GPR is commonly used to detect and delineate buried waste materials (bulk and drummed); to locate buried utilities (metallic and non-metallic); to locate buried structural components; to locate voids in/or below concrete. ACS Underground Solutions specializes in GPR for locating non-detectable objects underground that traditional locating methods have difficulty finding. What we were asked to do for this project? 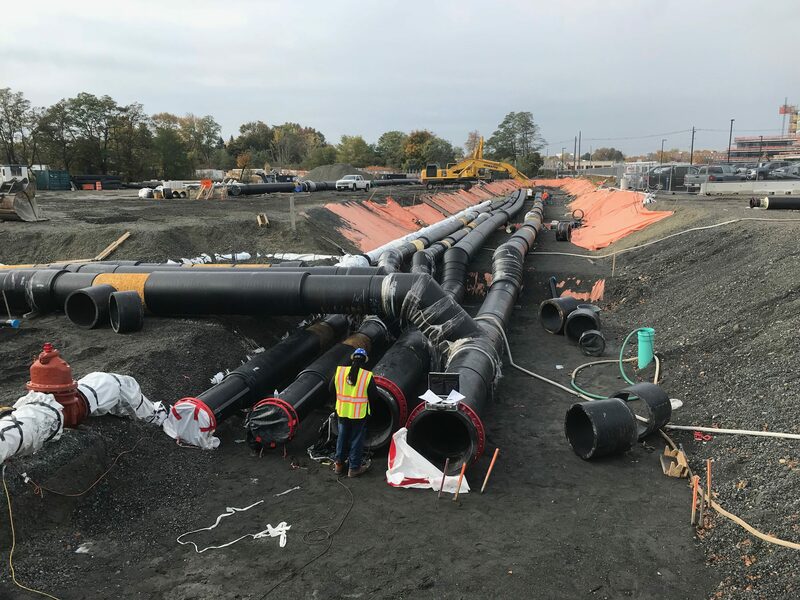 ACS Underground Solutions was contracted to clear ten (10) environmental test bore sites in Greenwich, CT. First location was at the old Mercedes-Benz building parking lot where we cleared eight (8) bore sites. Then we proceeded to the second site in the back parking lot of new Mercedes-Benz building and cleared two (2) additional bore locations. 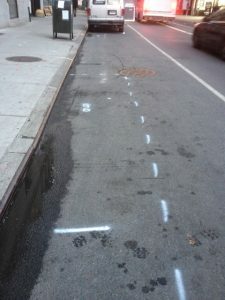 All utilities were verified, marked out and the fiber optic communication conduits were traced. 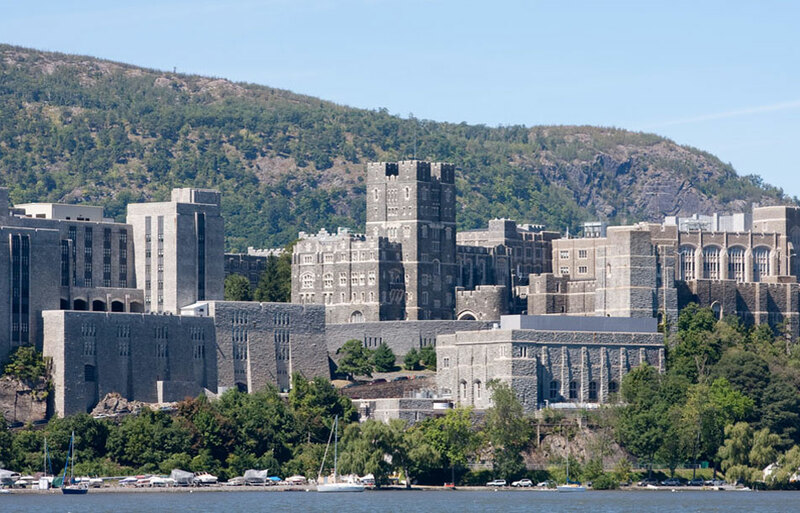 All areas were scanned with CAT and Ground Penetrating Radar (GPR). Once each boring location was cleared of utilities it was painted green for “GO” and flagged. 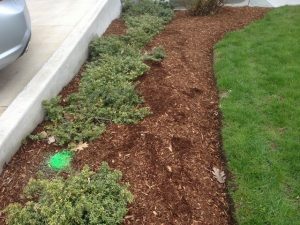 On this job site we did not come across a location that was not clear, however if that should have occurred and if desired by the client an alternate location could be determined, areas that are not clear to dig or drill are always painted red for “NO”. If you would like to learn more please email us or call us at 203-544-7190. 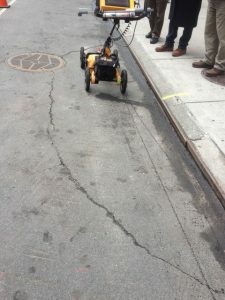 ACS Underground Solutions was hired to conduct an underground GPR survey to investigate voids in a 30’ x 15’ roadway area in NYC. Our technician arrived on site and reviewed utility drawings with client. The work boundaries where the GPR Survey took place were defined. Our technician scanned the area using Ground Penetrating Radar with a 500 MHz antenna and successfully detected and located voids approximately 1ft below the surface. Another void was located at an electric manhole along curb heading towards Park Avenue in Manhattan. Manhole in street was scanned and showed section of collapsed asphalt between manhole and sidewalk. 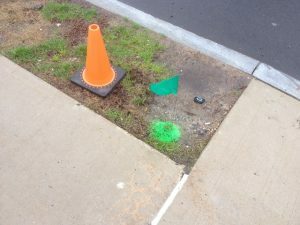 As the voids were located, they were marked-out on the ground with white paint for further reference. ACS technician also used Cable Avoidance Tool (CAT) locator to verify an electric conduit. A report summary was provided to the client upon completion of the underground survey work performed by ACS. When the machine is pushed across the ground surface of the subsurface area under investigation radio waves are simultaneously reflected to the equipment’s monitor. The image is then recorded as to what is being seen underground. ACS experienced technician’s are specially trained to determine what these images represent. Take proactive steps today by calling ACS Underground Solutions and let us put our experience and expert approach to work for you. 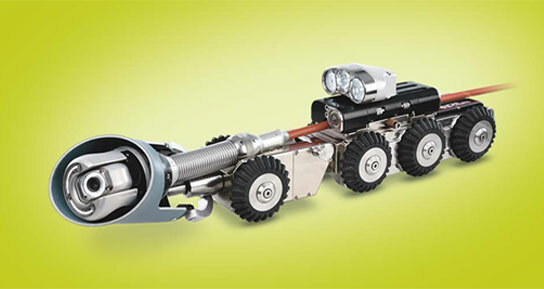 We know how to effectively and efficiently identify underground voids. If you would like to learn more please email us or call us at 203-544-7190.